We appreciate your loyalty and are sorry to hear this. Please feel free to contact us at 1 800 833 3118 with any questions. Love it; got it with my new Carhartt boots and it is longer than I expected: and I couldn't get it in tall so I'm happy with it, that is what I wanted the most too was the length. I ordered sizes bigger and it fits perfectly for a relaxed fit. Great!!!! I got the talls and they are excellent!!! It’s perfect, live all Carhartt. It’s exactly what I wanted and expected, as always. Love it! My only complaint is that I HATE TAGS POKING ME!There are tags inside the left waist, and when I cut them out, I cut holes in shirts.NO TAGS PLEASE. We are sorry to hear this has been your experience, and have shared your input with our Product Design department. Please contact us at 1 800 833 3118 if we can further assist in any way. You need more color choices! Thank you for your feed back. We have forwarded this over to our product design team as a suggestion. I have the picky-est boyfriend EVER when it comes to clothes. He hates thin material, tight fitting or uneven fitting clothes (ie; shorter than normal sleeves or a tighter torso type shirt), baggy shirts, shirts with writing AND shirts with pockets. You'd think "just wear plain shirts then"....HA! I WISH!. Anyways, about 4-5 years ago I made him try on this brand and style tshirt that every male in my life wears. He put it on, wiggled a bit, looked in the mirror and now ownes atleast 1 in every color and wears it day to day along with jeans from here and sweatshirts...AND HATS! He is carhartts number one fan. First, thanks for making clothes shopping easy for me, second thanks for making shirts that last years and look the same quality and third, thanks for being a brand so reputable, he'll wear the writing on his chest, literally! And thats only a few of them! This shirt runs a little big but was great after the first wash! Feels great, another great shirt by Carhartt! I have been wearing Carhartt T-shirts for several years. They are good quality, fair priced. Great shirt, sturdy material and the prefect fit for working all day. These are my favorite t shirts to buy. They last along time and don’t shrink and get all stretched out. Great buy. Ordered large tall, and fits like an XL. I love it. Great quality, heavy duty but not too heavy. Buying the rest of the colors ASAP. Comfortable durable impressed with length.. Very good quality. Comfortable, looks good on. It's the most comfortable shirt I've ever worn, I'll definitely be ordering more shirts in the future. These shirts are the only brand I will buy, they fit great but and last longer than any other shirt I've owned. The quality and style is great. I would recommend it to a friend. The only bad thing is that the sizes run too large. I ordered my shirt size, then had to return it, because it was too big. I had to get one size smaller. So watch out for that. If you can get to a Carhartt Store, that would be better, because you can try on the clothes there. We appreciate your kind words and are pleased to hear that you are happy with your garment. 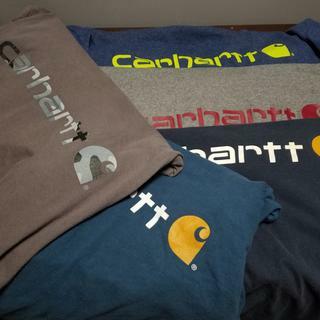 Thank you for choosing Carhartt. The small shirt I ordered fit like an XL. Best t-shirt I've ever owned. Durable and great fit. My go to attire for work or a day at the lake. I own a pile of these shirts and I keep coming back for more. I have had a rew of these. There are great! Fit is good. Durables! I love these shirts!!! They run a little big but for me it's a good thing. I normally wear a 2xl but I order an xl in this shirt and it is perfect!! I'm very pleased with the color and fit of my cobalt carhartt t-shirt. I got 2 of these for my husband to replace the ones he has worn out from 2007! Hope I get another 8 years out of these. Great shirt, would recommend to others. I use to weigh over 190 lbs and for 5' 6.5" that was fat!!!!!! So I lost 52 lbs and had to buy an all new clothes. I decided to buy mostly Carhartt. I had already owned a few shirts and pants and really like the quality and look. So I went from an xl shirt to a small. I own over 100 shirts about 8-10 jackets and who know how many jeans and pants. My boys and my girl and wife wears carhartt. Everything was good for a couple of years until now carhartt seems to be dropping small in favor of medium size. Medium fits but not nearly as good as a small. If you wear your shirts tucked in your pants like me it'll be ok because they are long. I just wish they would keep making small shirts. BEST ANSWER: The K195 is Peat has a white logo. My husband will only buy the logo t shirts imported from Haiti. He says that they are better quality. Is there any way to order tshirts from the Haiti distribution? BEST ANSWER: There is not a way to order shirts manufactured in a specific country. can I purchase the logo shirt with out any print? Is this shirt true to size? BEST ANSWER: Yes, this style is true to size. Shirts run too big. I had to get a size smaller. The short-sleeve Logo T-shirt is true to Carhartt original size, which allows for ample room to work and move. If you are looking for a more slim athletic fit, I suggest ordering a size smaller. Yes they are, I ordered six 2X shirts and they fit perfectly. They also don't shrink after washing. Enjoy! It does run a little on the big side! It was long but shrunk a little in the wash. These run a bit big actually because they are original fit, not relaxed. No. The small shirts fit like a large. Not true to size at all. Large Tall fits like an XL. Fits more like an XL. BEST ANSWER: No, this shirt does not have a pocket on the front. You may wish to consider our K87 Workwear Pocket T-Shirt. No pocket on the front of shirt.